Helps relieve the symptoms associated with painful bladder syndrome / interstitial cystitis. PBS/IC is a chronic condition, with signs and symptoms that vary from patient to patient. It straddles medical specialties, requiring that gynecologists, urologists, and family physicians work together to increase diagnostic accuracy5 and treatment options. 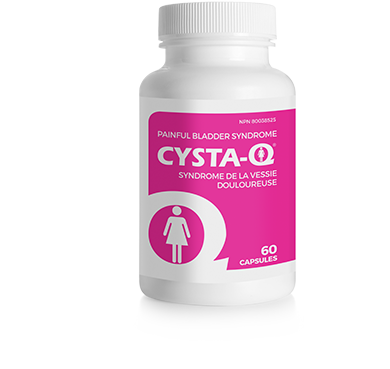 CYSTA-Q® is a unique, non-prescription, quercetin-based phytotherapeutic compound clinically proven to help relieve the symptoms associated with painful bladder syndrome / interstitial cystitis (PBS/IC).8 In addition to quercetin, this unique formulation also includes bromelain and papain, natural ingredients that enhance the absorption of quercetin and work in combination with quercetin to relieve the symptoms associated with PBS/IC. Quercetin is found naturally—for instance, in apples, grapes, green tea, and onions—and has antioxidant and anti-inflammatory properties. It is a multi-potent bioflavonoid, with great potential for the prevention and treatment of disease,9 which helps reduce inflammation and maintain the body’s inflammatory responses. Adult men and women: Take one capsule 2 times daily, preferably with a meal or as directed by your healthcare practitioner. Use for a minimum of 4 weeks to see beneficial effects. CYSTA-Q® is well tolerated by most patients and side effects are rare. Some patients have reported mild nausea if taken on an empty stomach or slight tingling in the extremities shortly after their first dose. Consult a healthcare practitioner prior to use if you are taking quinolone antibiotics, experience gastrointestinal discomfort or transient joint pain, are pregnant or breastfeeding, have history of kidney stones, have a gastrointestinal lesion/ulcer, are taking an anticoagulant/blood thinner, anti-inflammatory or antibiotic or if you are having surgery. Discontinue use if you have a hypersensitive/allergic reaction, nausea, vomiting or diarrhea. Consult a healthcare practitioner if symptoms persist after 3 months or worsen. Do not use if seal is broken or missing. Keep out of reach of children. Q. What is painful bladder syndrome / interstitial cystitis (PBS / IC)? 1. Hanno P and Dmochowski R. Status of international consensus on interstitial cystitis/bladder pain syndrome/painful bladder syndrome: 2008 snapshot. Neurourology and Urodynamics 2009;28:274. Q. How can CYSTA-Q® help me? 8. Katske F, Shoskes DA, Sender M, et al. Treatment of interstitial cystitis with a quercetin supplement. Tech Urol. 2001. Mar;7(1):44-6. Q. Do I need a prescription from a healthcare practitioner in order to obtain CYSTA-Q®? CYSTA-Q® is a non-prescription natural health product approved by Health Canada, and as such does not require a prescription for purchase. Quercetin is found naturally—for instance, in apples, grapes, green tea, and onions—and has antioxidant and anti-inflammatory properties. It is a multi-potent bioflavonoid, with great potential for the prevention and treatment of disease,9 that helps reduce inflammation and maintain the body’s inflammatory responses. Q. What are the other ingredients in CYSTA-Q®? Q. How do I take CYSTA-Q®? For adult men and women: Take one capsule 2 times daily, preferably with a meal or as directed by your healthcare practitioner. Q. How long do I need to take CYSTA-Q® before I feel the beneficial effects? Take CYSTA-Q® for a minimum of 4 weeks to see beneficial effects. Q. Is CYSTA-Q® well tolerated? CYSTA-Q® is well tolerated by most patients and side effects are rare. Some people have reported mild nausea if taken on an empty stomach or slight tingling in the extremities shortly after their first dose. Speak to your healthcare practitioner for more information. Q. Has CYSTA-Q® been studied in clinical trials? Q. Are there any contraindications? Consult a healthcare practitioner prior to use if you are taking quinolone antibiotics, experience gastrointestinal discomfort or transient joint pain, are pregnant of breastfeeding, have history of kidney stones, have a gastrointestinal lesion/ulcer, are taking an anticoagulant/blood thinner, anti-inflammatory or antibiotic or if you are having surgery. Discontinue use if you have a hypersensitive/allergic reaction, nausea, vomiting or diarrhea. Consult a healthcare practitioner if symptoms persist after 3 months or worsen. Q. Where is CYSTA-Q® made? CYSTA-Q® is made in the USA. Q. Where can I buy CYSTA-Q® in Canada?